$649 Seen a lower price? Meet the ultimate sequencer-synth. Everything you know and love about the MiniBrute 2, but integrating a powerful, triple-layer sequencer. Where the original MiniBrute brought analog synthesis to the masses, MiniBrute 2 brings the huge potential of Eurorack modular to a new audience. The MiniBrute 2S combines lots of exciting new features without losing sight of what made the original so special: analog tone, powerful sound shaping features, a step-sequencer, and an arpeggiator. Featuring two of Arturia's legendary Brute oscillators, the classic Steiner-Parker filter, an innovative looping envelope, and hands-on control for every parameter, MiniBrute 2S is a monosynth to be reckoned with. MiniBrute 2S is all about freedom: freedom to create totally unique, inspiring sounds; freedom to build a system that's unique to you; freedom to expand your collection at your own pace. One of the most exciting aspects of MiniBrute 2S is how perfectly it integrates into modular setups. It features a comprehensive modulation matrix with dozens of sources and destinations, letting you experiment with the instrument's own sound, or hook it up to synth and effect modules. Featuring a revolutionary new connection system, it is also fully compatible with the RackBrute module housing system. Try out a few sounds from the included Preset Cookbook, hone your synth skills and start patching, expand using the RackBrute and your favorite Eurorack modules, the possibilities are endless. Swapping out a keyboard for velocity and pressure sensitive performance pads, the MiniBrute 2S features a triple-layer, monophonic sequencer that works in the same way as Arturia's award-winning KeyStep controller. You can control your notes with one track, and use the other 2 to sequence parameters like gates, CV, LFOs, and envelopes. You can do this in real-time, or by step-editing. - MiniBrute 2S allows for a huge analog sound-shaping power (2 multi-voice VCOs, loopable envelopes, twin LFOs, self oscillating multimode filter). - MiniBrute 2S is the perfect Electronic Dance Music synth: 3-track, 64-step sequencer and sync-locked arpeggiator. This is exactly what musicians need to create genres such as techno or house. - Velocity and pressure sensitive pads to play melodies and enter steps into the sequencer. No need to be a trained keyboardist to enjoy it! 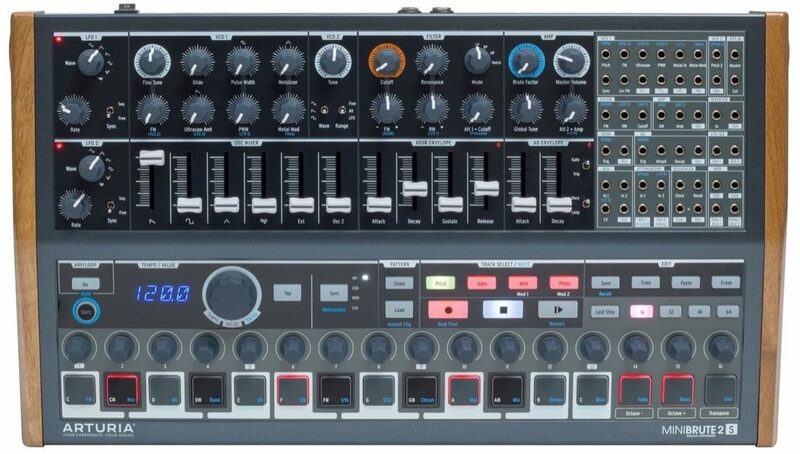 - Amazing connectivity: including a mod matrix with 48 CV inputs and outputs, on top of the usual Audio, MIDI, and USB ins and outs. 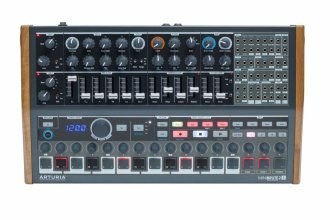 - RackBrute ready: MiniBrute 2S can be integrated into the Arturia RackBrute system, giving you a creative hub to house and control your modular gear.